SHOW SOME “RESPECT” for the Definitive Aretha Franklin Tribute Show! Valerie has heard many times “You look and sound like Aretha” so she put together the Aretha Tribute band because number one, she loves singing her music! 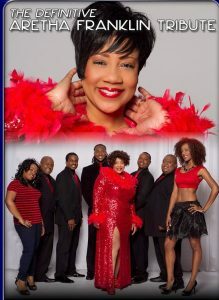 Valerie Tyson and her band have played for various weddings, concerts, gala balls, festivals, city events, etc. and have performed at many of the country clubs, casinos, and hotels including The Ritz Carlton’s, The Four Seasons. They have had the opportunity to be the opening act for Al Green, Spyro Gyra, and Earth Wind and Fire at Sunfest In West Palm Beach.